TRINIDAD, Oct 09, 2018 (SEND2PRESS NEWSWIRE) — With society continuing to place great emphasis on youthfulness, for many women, aging presents its own unique midlife crisis. Desiree Arnold understands firsthand the emotional and physical toil on women upon reaching their 40’s and beyond. A holistic practitioner, naturopath and the founder of Lifely Up, a web portal dedicated to menopausal transition, Arnold wanted to nurture women through a passage that she feels should be celebrated not vilified. She took it upon herself to consult female experts from around the world for their insight and advice and the “Women’s Midlife Revolution Summit” is the result of her efforts. A free online conference set to launch October 23 through November 2, 2018 the “Women’s Midlife Revolution Summit 2018” is available at https://womensmidliferevolutionsummit.com/. The “Women’s Midlife Revolution Summit 2018” presents a wonderful opportunity for women to learn, bond and share in the privacy of their homes as Arnold interviews 22 professionals, releasing two new interviews per day over a 11-day period. Female nutritionists, doctors, herbalists, holistic therapists, authors, life coaches, entrepreneurs, hormone experts, and physical trainers have all been gathered to lend credence to the joy of seasoned womanhood. Some of the professionals who weigh in with their wisdom include Dr. Judith Boice, ND, LAc, FABNO, naturopathic doctor, licensed acupuncturist, and Fellow of the American Board of Naturopathic Oncology; Jennifer Gibbons-Joseph, CPC, ELI-MP Managing Director of Conec Professional Life Coaching Services Ltd; Susun Weed, author of the Wise Woman Herbal series and the voice of the Wise Woman Tradition; Meiling, the tour de force behind her premier Caribbean fashion house; Yvonne Heath, author of “Love Your Life to Death”; and Makeda Smith, veteran entertainment industry publicist and creator of the FlyingOver50 dance movement brand. 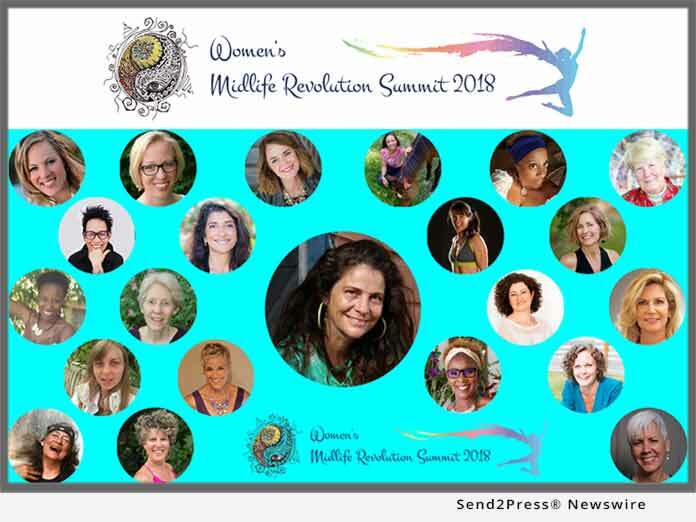 For registration and information about “Women’s Midlife Revolution Summit 2018” go to https://womensmidliferevolutionsummit.com now!